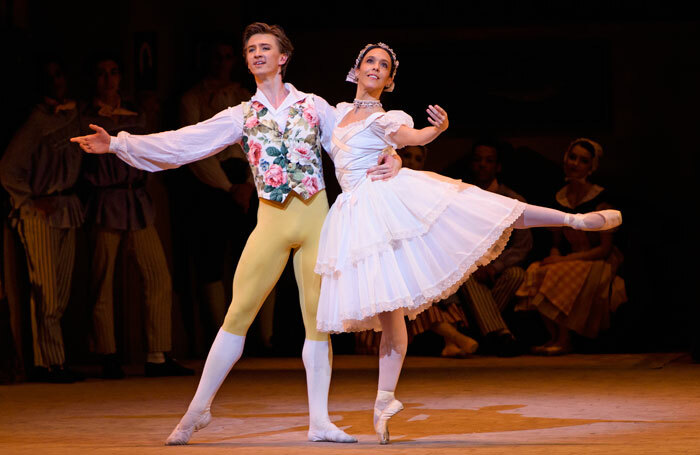 Reviving La Fille Mal Gardee is always popular for the Royal Ballet. The funny, sunny romcom was created in 1960 by Frederick Ashton, and it has both dazzling direction and immense charm. But Ashton does more than please us with the wayward daughter of the title marrying her true love, rather than the money man her mother has in mind. Along side this romantic love he shows us a mother’s love for her child – some of it misguided. Will Tuckett is perfectly cast as Widow Simone, mother of the wayward Lise. Tuckett exactly catches Simone’s affection for her daughter and also her ambition that Lise should marry well, despite glaring clues about the wealthy Alain (Paul Kay). He is a simple soul, ill-suited to marriage, yet Simone soldiers on believing she is doing the best for her daughter. Gary Avis’ Thomas, father of the hapless Alain, is less finely judged. Thomas is as keen to marry his son as Simone is her daughter, hoping it will make a man of his eternal child. However, Avis is more steamroller than impatient papa, unwilling to acknowledge his son is not marriage material. In the lead roles Vadim Muntagirov is an elegant Colas, the young farmer in love with Lise, although he perhaps over plays Ashton’s subtle gestures and restrained style – some of his jumps and finishes are more Russian capital than English countryside. As Lise, Laura Morera is at her best in the acting scenes, such as when she imagines married life with Colas, and when she tells her mother he is the only man for her.